Some native (white stems, ground crawlers) some Non-Native (Rubus procerus , the Himalayan Blackberry (PDF), highly invasive). Medicinal uses: Roots are harvested in the fall or before new growth in the spring. Roots traditionally used for diarrhea, dysentery, wounds, and female tonic. Leaves are strongly astringent and may be used as a mouthwash to strengthen spongy gums and ease mouth ulcers; a decoction can be used to relieve diarrhea and hemorrhoids. 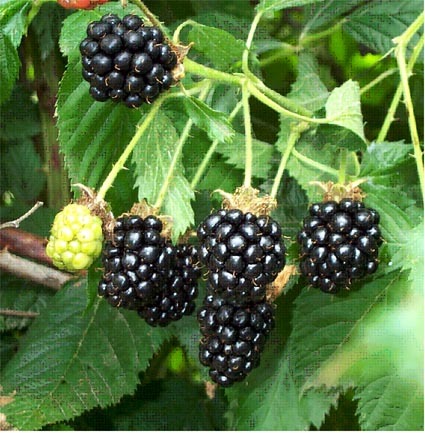 Nutritional information: Raspberries and blackberries are an excellent source of fiber, manganese, vitamin C, flavonoids, and ellagic acid. They are a very good source of vitamin B2 as well as a good source of other B vitamins, such as folic acid, niacin, pantothenic acid, and vitamin B6 (Murray 312). Cautions: none known (Chevallier 263).